While it may not be apparent to others who are not sailors, this flag is well known in the sailing world by beginners and veterans alike. 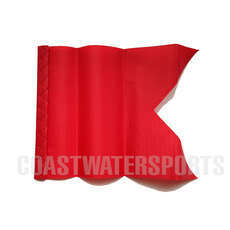 By using our protest flags you’re guaranteed universal signals that are sure to be noticed by others while out on the water. Whether you’re stocking up on the flags or replacing an existing one, this protest flag is the perfect choice and an ideal accompaniment for your boat. The RWO protest flag is designed to be lightweight, bright and noticeable in order to grab the attention of race officials and other sailors. It is commonly used to raise a protest issue with another boat. While the flag is a key indicator it is important the the occupant of the boat raising the flag calls our ‘protest’ towards the boat they’re issuing it towards at the first available moment. It’s important that this flag can be quickly attached and that’s made a lot easier and simpler by the velcro fastening on the end, ensuring that once you feel an issue should be raised you can protest it with another boat immediately. If you’re taking part in a race with your sailing dinghy, we highly recommend you stock up on these protest flags in order to be able to compete. If you’re unable to protest an issue with another boat your performance may suffer and you could be short handed in the long run.Take a look at our protest flags today and grab yourself one to ensure you’re ready to race.